I hope my genealogy stuff is helpful. I have many surnames that might be part of your family. Here is some Pickens Clan Information. The Pickens Coat of Arms (Top of page) is registered and officially documented in Burkes General Armory. There are a few variations of earlier Clans registered elsewhere but this is the most reliable. "GU. A SALTIRE ENGR. BETW. FOUR MULLETS OR, PIERCED OF THE FIELD." "Red; a gold, engrailed St. Andrews cross between four gold stars pierced Red." "The crest is an armored Helm with visor and breaths" "The motto spells PICKENS"
To have retained the name of pickens since the 16th century is actually very difficult for our Scottish origins. At that time they changed their names to reflect where they live or where they are from. They also changed spelling because of illiteracy. Although, Presbyterians pride themselves on being literate, often a man could not spell his own name and it was spelled by the Town Clerk however he thought it should be spelled. Sometimes a man would join a Highland Clan for protection and would adopt a clan surname, usually a "Mac" followed by the chief's name. Many Scottish surnames were simply their fathers first name with a "son" attached. This is believed to be the way Pickens came about. It appears to be patronymical in origin and can be associated with Normans, French, Scots and English. For a history of the PICKENS name click here. as told by Stuart Clark Pickens. About 870 a.d. the Viking "Stirgud the Stout" and his men landed in the Orkneys and Northern Scotland. They came from Norway in an effort to expand. The Pickens name comes from this group of Vikings. Later, under their Earl, Thorfinn Rollo, they invaded France about 910 AD. They held Paris under siege until the French King, Charles the Simple, conceded defeat and granted Northern France to Rollo, who became the first Duke of Normandy. A descendant of Duke Rollo was Duke William who invaded England in 1066. William had a census taken in England in 1086 and compiled the Domesday Book. This Listing of names has Picken listed and many variations of the spelling as well. Most notably "Pinkeny" which in the 1200's lived in Picquigny in the Somme in the arrondisement of Amiens in Normandy. Ghilo Pinkeny was a Domesday book tenant in chief in the county of Northampton and others, and his son Ghilo, founded the Priory of Weedon in Northampton which was a branch of the original Priory at St. Lucien in Beauvais near Picquigny. They branched into Yorkshire and acquired Shrover Hall where they were landed gentry. They also established a seat in Oxfordshire where the name was Pinke. The Pickens name emerged as a notable English family name in the county of Northampton where they were recorded as "a family of great antiquity seated as Lords of the Manor and Estates in that shire." In the late 1200's many of the Norman families of England moved north to Scotland following Earl David of Huntingdon (who later became the second King of Scotland). They expanded into Scotland where the names were Pinkie, Pickie, and Picken. They settled in Inveresk in Midlothian, Scotland. Peter Pinkie was listed as a follower of Robert the Bruce in 1303. They flourished on these estates for several centuries spreading throughout Scotland. There were Pickenses at the battle of Bannockburn in 1314 defeating the English who outnumbered them 5 to 1, gaining Scottish Independence. This battle was the first of many major victories giving the Scots a good reputation for winning battles. In 1328 the Treaty of Northhampton was signed between the English King, Edward III and Robert I (Bruce) officially recognizing Scottish independence and Robert Bruce as it's king. The following year, Earl David was crowned King upon the death of Robert the Bruce and Scotland was well on its way thanks in part to the efforts of the Pickens family. In 1521 on May the 26th , Martin Luther was banned by the edict of Worms for his religious beliefs. Any deviation from Catholicism was considered blasphemous. There was a tremendous effort throughout Europe to spread Catholicism and keep these Protestant dissidents from converting the masses. The Scottish would not be told how to think and so would not stand for any religious persecution. On the English border the Scotch Presbyterians were treated as low life and so the border was a hard place to live. They were forced into guerilla warfare just to survive. These "Border Reevers" became the best frontier fighters in the world. There were many of the Edinburgh Pickenses among this group of fighting farmers. The Border raids were finally quieted when the Scottish king James IV took the English throne as James I in 1603. These fighters were later used by the English to quiet the Irish. The French huguenots in the mid 1500's felt the same as the Scottish about religious persecution, and this common belief of religious freedom forged a friendship between the Scots and the French that lasted until 1685. It was during this time, the late 1500's, that one Robert Picken/Picon from Scotland went to France during the reign of King Henry IV (1589 - 1610). He held a diplomatic post in the Kings Court until 1610 when Louis XIII took the crown. He then returned to Scotland near the English border and lived there until his death. He had family in Edinburgh, Stewarton, Glasgow, and the Kintyre Peninsula. The border had become a friendly place at the time because a Scottish King sat on the English throne. (James I was also James VI of Scotland and the son of Mary, Queen of Scots). This made for what Robert thought would be an easy retirement. When his son Andrew was born in 1624, the political climate was getting difficult. Charles I began his reign over England in 1625 and some of the attitudes changed toward the "Wily Border Reevers of Scotland", so called because of the old hatred between the two countries under Elizabeth I (1558 - 1603). The Covenanters were also uprising against the English crown and England's religious civil war was reaching into Scotland. The Scottish king James was no longer king and old hatreds built up again atop new hatreds. But it was still a tolerable life for Robert Picken/Picon because of his diplomatic status. Robert Senior died in 1644 and is buried in Lowland Scotland. There were other Pickenses (Pickan) in Edinburgh who were believed to be Robert Picon's (Pickens) brothers. A lot of their children moved to Ulster in the 1620's and 1630's. This was a colonization effort of the English to make Ireland "civilized". In 1644 Andrew had a son Robert named after Andrew's father. Robert was born in Scotland according to LDS records. He went to France with his father at a young age. While in France, Robert met the young widow of a Frenchman named Jean Bonneau. Her name was Esther Jeane Benoit and she was from a Protestant huguenot family. They began a family there. Among Robert's children were William Henry Pickens, who was born in 1669 (LDS) in France. His other sons were Andrew, John, Robert, Israel, and Thomas, and a daughter who married a Davis. In 1651 Oliver Cromwell defeated Charles and began the commonwealth. The Irish Catholic rebellion was in full swing in Ireland and the English sent the Presbyterian/Covenanter Scottish armies (who called themselves God's army) to stop them. Catholicism was outlawed in Ireland and the Scots (fighting for the English) tried to convert the Irish Catholic Papists to the Presbyterian faith. That failed because the Scots didn't want to tell people what to believe. So Cromwell's army took over to enforce the English law. Andrew Picken/Picon still believed, as most Scots did, in religious freedom and wanted to avoid that war because it seemed to him to be hypocritical. So he took his family to France to the town that his father had previously lived in. The families enjoyed a peaceful existence in France until 1685 when they revoked the Edict of Nantes. There was no more religious freedom in France unless you were Catholic. This was a good reason for Andrew and his family to return to Scotland and find their relatives. So Robert and Esther, his parents and his children, and a host of French friends all went to Scotland to practice the Presbyterian faith. They became split on the subject of becoming Covenanters. Most believed that everyone should have the freedom to choose their religion. The Covenanters believed only in the right to be Presbyterian. The Catholics believed they were the one true religion. This is what David Cody, Assistant Professor of English, Hartwick College had to say about the Covenanters. "The Covenanters were supporters of the Scottish Covenant of 1638, which was a national protest against the ecclesiastical innovations in the Scottish Church imposed at Edinburgh and subscribed to by various nobles, ministers, and burgesses. Those who signed the Covenant, which was initially neither anti-royalist nor anti-Episcopalian, though it became both, declared that they would defend their religious beliefs against any changes not mandated by free assemblies and the Scottish Parliament. The term was also applied to their spiritual heirs who opposed the reintroduction of episcopacy in 1662. "Some Covenanters were also signatories of the Apologetical Declaration which declared war on all established political officials, soldiers, judges, conformist ministers, and informers. This document, however, provoked a response upon the part of the authorities which became known as the Killing Times: during 1684-85, at least 78 persons were summarily executed for refusing to retract their allegiance to the declaration, and many others were executed after trial. Despite often brutal repression, especially during the period between 1678 and 1685, the excluded ministers, supported by the local aristocracy and independent peasantry, maintained an underground church in the south-western parts of Scotland." South Western Scotland is where our ancestors moved to at the time, Kintyre. But in England the Covenanters were quelled and the Presbyterians were the lowest of second class citizens. Presbyterian marriages were considered not valid and they were labeled as fornicators. Anyone seen with a Presbyterian Covenanter was arrested with him and whole prisons were built to house them. It was a bad time near the border for humble Scottish cattle ranchers who were just trying to make a living. Their land could no longer support them due to the ravages of war, and the English demanded outrageous taxes and rents. This caused so many people to leave Scotland that whole towns were left deserted. The massive emigration was compared to great swarms of bees rising out of the field. A lot of the Pickenses went to the faraway tip of the Kintyre Peninsula to escape the strife and farm new land. 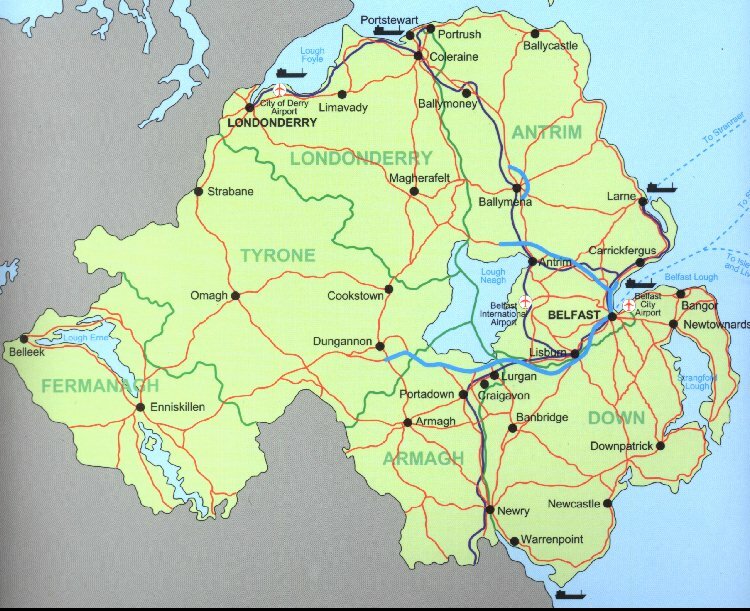 It was 140 miles to the nearest city (Glasgow) along a thin strip of land, and it was only 14 miles across the water to Ireland (Ulster). Eventually Campbeltown became a busy port for refugees. Then came the revolution of 1688 and Presbyterianism was restored as the state religion in Scotland. In 1685, when the Pickenses arrived back in Scotland from France, they found that all their relatives had moved to Ulster, Northern Ireland. In the search for peace and religious freedom most of them followed the rest of their Clan to Ulster by way of Campbeltown, Argyll, Scotland. It seems that on their way through Scotland some members of the family stayed in the towns the went through. 1. WILLIAM Henry born in France in 1669 went to Ireland with his father by way of Campbeltown, married Margaret Pike in 1693 in Ireland and had the following children all in Ireland: Israel born 1693; Margaret born 1695; Andrew born 1699; Robert Pike born 1697; William born 1705; John born 1710; Israel born 1712; Gabriel born 1715; and Lucy born 1718. All were born in Ireland and all moved to America in the spring of 1719. They appear in 1719 in Bensalem Church in Bucks County Pennsylvania as recent Immigrants from Ireland. 2. ANDREW moved to Fenwick and married Jane Mitchall; they had a daughter named Bessie who was christened May 13, 1705. 3. JOHN Stayed at Campbeltown and married Anne Colvine on June 2, 1691. They had at least 2 sons, James born March 20, 1692; and Alexander born July 9, 1693. 4. ROBERT moved to Glasgow and married Janet Corsby; they had at least 2 sons, Robert Christened June 5, 1707; and Alexander Christened August 27, 1721. 5. ISREAL born in France in 1676 went to Ireland with his father by way of Campbeltown, married and had at least 2 sons; William born in 1720, and Thomas born in 1730. 6. THOMAS stayed in Campbeltown and married a ? Clark; they had a daughter named Martha christened June 5 1692. 7. ?? A daughter who married a Davis. In Ulster in the 1690's, the Irish papists, who were still mad at the Scots for Cromwell's war 40 years earlier, banned Presbyterian services, and outlawed their ministers. So the Scotch/Irish Presbyterians had to have their services in the woods with guards posted at the corners to keep their ministers from being arrested. Hence the phrase, "They read their bibles with their guns cocked." The Irish cities of Derry and Coleraine were supposed to be English cities given to Lord Abercorn as a result of the Nine Years War. The Scots built a 20-foot wall around Derry to defend it from the English siege in the brutal winter of 1688-1689. The Scots lost the siege but were not displaced and so they took over Coleraine. Then came the Battle of the Boyne, on July 1, 1690. After that the Protestants had no rights anymore. Ulster was so full of Scots that they outnumbered the English by 20 to 1. The Irish were happy that the English were being replaced by Scots, but still didn't want so many Protestants in their country. Life was becoming just as hard for the Scots in Ireland as it was near the English border. This makes three generations that had to relocate because of religious persecution. They were tired of it. They had heard of Pennsylvania. There was a land where no one would tell you what to think or how to live. This land is not only rich farmland, but it is free for the taking! You could preach or worship any religion you want, Right next to someone preaching another religion. No tax, No Tithes, No rents, and No persecution. Imagine, Just walk into the frontier and claim a farm. Run it for only yourself and raise a family. Start a small village of just friends and family. If you're a criminal - leave it behind. If you're poor - leave it behind. If you're afraid of being arrested for an "idea" - leave it behind. There is peace, prosperity and freedom on the frontier in the New World. And all you have to do is get there. There had been no harvest for 5 years due to the ravages of war and several severe winters. This recreated the need for emigration in the early days of the 1700's. Many paid passage by agreeing to 4 years as indentured servants in order to take advantage of the fertile and free land in America. Passage to America was not cheap, and to move your whole family (which was quite large back then) plus all your livestock, would cost a bundle. One could only go by ship and the voyage was tough enough without kids and livestock, if you could even get passage for livestock which wasn't likely. If you could not afford passage, the only way was indentured servitude. There were rich American plantation owners who would pay for a man's passage if he would work for a year. If he brought his family he would have to work four years. Unfortunately, some emigrants would literally jump from the ship to avoid the servitude altogether. They would disappear into the frontier and the plantation owner was out a considerable sum of money. There were many references to bad ocean voyages, and even in the best of trips, which lasted 2 to 3 weeks; the ships were overloaded with people, the rations were short or just barely enough, the food was vermin ridden, and the water was stagnant and green with life. Many were blown off course northward. The weather would turn very cold and even icebergs were sighted. Hunger and thirst reduced them to shadows. Many killed themselves by drinking salt water or their own urine. Their journey lasted up to 13 weeks or 3 1/2 months. The disembarkation process at their destination was also harsh. First the ones who could pay full price were allowed to pay and get off the boat. Next the healthy ones were sold to their new masters for the full fee. Then unhealthy ones were sold at auction. This process often took several weeks. If one of the family died, the rest of the family members were held accountable for passage fees of the deceased. However, the Ulstermen thought they had found the Promised Land. The Scots/Irish who had indentured themselves to reach the US, set out for the frontier immediately on fulfilling their Indenture. 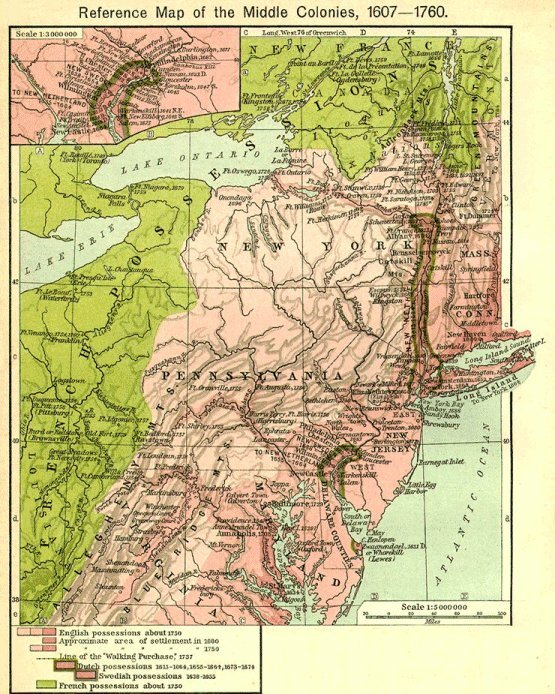 The "Frontier" was 40-50 miles west of Philadelphia. Across the Susquehanna River was the Alleghenies which marked the frontier. This is where the German Palatines settled. The Scots usually settled as far out as possible to be far enough from society so as to make their own kind of living. Just beyond the Ohio River lay the rich Cumberland Valley. Eventually, a ferry opened the Cumberland Valley to the Scots/Irish and it became their heartland. The French claimed to own the frontier beyond the Ohio River but there was no way to stem the flow of Scots/Irish to the area. 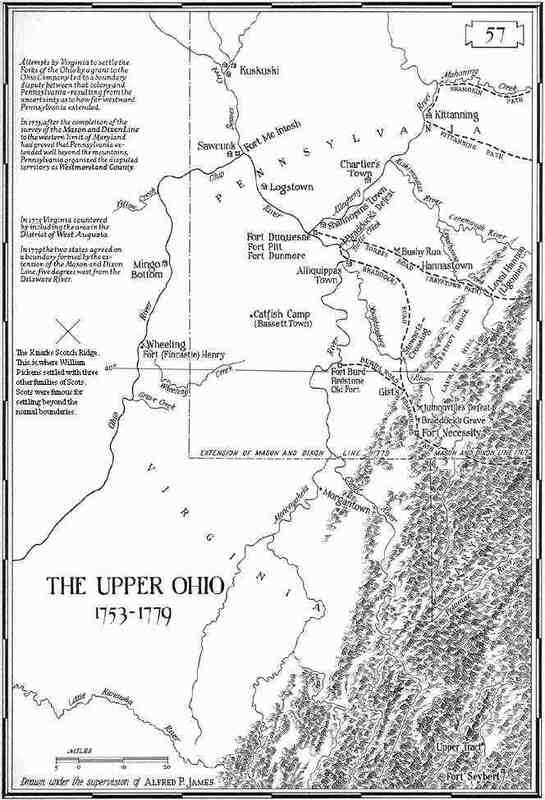 Our ancestors settled in what was known as the "Seven Ranges" area, just beyond the Ohio River. They renamed the area "Scotch Ridge". Scots were famous for being the furthest out on the frontier. They marked their property by cutting their initials in trees on their boundaries. Then cut circles in the bark to kill the tree. They refused to pay for the land, since God owned it. The wives spun flax, milled the corn, worked in the fields and bore 10-15 children. They also educated their own children. Homemade whiskey was important for trade and made a harsh frontier life more tolerable. The Whiskey also made the Indians more friendly to the Scots than the Germans or English. So the Scots made a good barrier between the Indians and the settled areas. On September 9, 1762, William Pickens was born in Campbeltown, Argyll, Scotland, on the Kintyre Peninsula. It was 140 miles by road to Glasgow, the nearest city. But only 14 miles across the water was Ballycastle, Ulster, Northern Ireland. He had relatives there that had gone there in the 1600's. George III was on the throne, which made it a hard time for farmers in Scotland again. When William had heard that America was fighting for her Independence from England, he used all his resources to get there. They could not afford passage, and could not even get to Ireland from which the American bound boats sailed. Little is known of William's voyage to America. Through my research I have found that it is not likely that he had two brothers with him. We cannot find a ships record of his passage which leads to other means. Some say that he had a job aboard ship that would pay his passage but keep him off a passenger list. Some say he jumped from the Philadelphia bound ship in the Delaware Bay and swam to Maryland. Any of these means would be very difficult for three brothers together. I prefer to think that he somehow gained the proper fees and landed in Maryland dry and ready for the new world. William, the immigrant, is said to have landed in Maryland with his two brothers. This legend began with a publishing by the late Samuel Alexander Clark Pickens in 1925. I believe it was his way of explaining away all the unconnected Pickenses in this country without going overseas. Luckily, research is a lot easier now with the "www." and a new story has emerged. William did have three brothers. Alexander who married Janet Ross in Campbeltown and had four children between 1794 and 1803 in Campbeltown. John who married Agness Fleeming in Campbeltown and had two children between 1796 and 1797 in Campbeltown. Edward was born in 1779 in Campbeltown which also puts his father Alexander in Campbeltown then and Edward would have been less than ten if William brought him. I suppose it is possible that one or two of these brothers came to America only to go back to Scotland but that is unlikely. Or, his father Alexander and his very young brother Edward came with him between 1780 and 1789. I havent found where Alexander is buried, but if it is in Scotland then he wouldn't have come to America. The Pickens line in the south came over much earlier. They arrived in Pennsylvania in 1719 (William Henry Pickens and Margaret Pike with all their children) from Ireland where they lived. I will soon connect our William's father Alexander, with a brother of William Henry. Alexander (our William's father) was not born in Campbeltown, and probobly not in Scotland at all. If he came to Campbeltown from Ireland then his Grandfather was probably Isreal. If he came from Glasgow then his Grandfather was probably Robert. If he came back to Campbeltown because his father returned there then his Grandfather was probably John. All three of these are brothers of William Henry and children of Robert and Ester. Confused?? Click here for a list. There is a Joshua Pickens who went down the Ohio river toward Oklahoma in the late 1700's, but the connection to him is from William Henry also.